The Skyhook kite sail is an innovative non-directional kite designed by Paul's Fishing Kites to optimize the power of fishing kites. The Skyhook sail attaches to the kiteline under your main kite and increases the pull to around double that of just flying the kite alone. 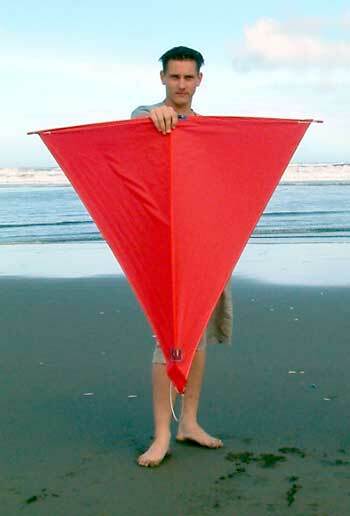 Many kite fishers consider the Skyhook kite sail an indispensable part of their kite fishing set up. 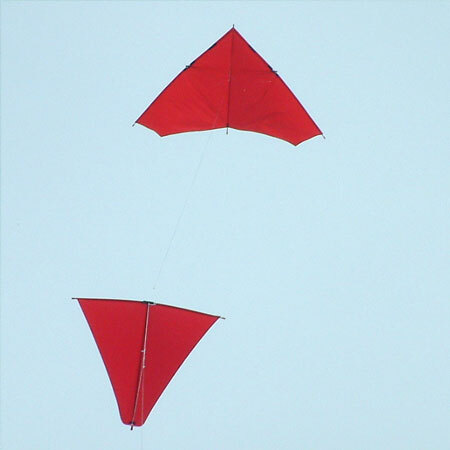 Another huge advantage is that the Skyhook increases the tacking range of the kite it is flown beneath. The increased tackability is due to the three tail rope adjustments. The different settings allow the angle of attack to be altered and consequently bring both kites further into the wind. In many respects the Skyhook is similar to a spinnaker sail on a yacht. Photo Above: A Skyhook Kite Sail flying under a Nighthawk kite. It is also much cheaper than buying a bigger kite. The skyhook kite sail is connected to the kite line via a strong braided nylon cord. This cord is supplied with the skyhook and will need to be tied into the kiteline. We use an improved uni knot to make these joins. The white cord at the front of the skyhook is the cord inserted into the kiteline. The large sail area of the Skyhook adds considerable pull to a Nighthawk or Super kite. The Large Skyhook is designed to be flown in conjunction with either the Super Kite or Nighthawk Kite. On the west coast the skyhook can often make the difference between being caught in the rip or getting the gear out straight offshore. The large Skyhook Kite Sail is an excellent performer whenever more tack or pulling power is required. Suitable for all 65 to 100 kg breaking strain rigs.